If you are like me, you have one or two go-to menu items at each of your favorite restaurants. I tend to be drawn to items that use my favorite ingredients and meals you can’t just find anywhere. You can get a burger, turkey sandwich or lasagna at hundreds of restaurants. But Linguine with Chicken Livers or Matzah and Eggs with Salami…you can only get that by going to that one restaurant. And if that restaurant ever closed, you wouldn’t ever be able to get it again. I love getting breakfast out, and one of the best breakfast dishes I’ve ever had is Companion’s baked egg dishes. They usually have a variety of baked eggs, including a cheese version and one with bacon. My favorite is the one with the rosemary potatoes. They actually posted the recipe on their website, but it’s worth stopping in on the weekends and letting them cook it up for you. It just wouldn’t be the same at home. I know that Pasta House isn’t the most exciting restaurant in town, but I just love their Linguine with Chicken Livers. The linguine is served with a garlicky parmesan cheese cream sauce. It has tons more flavor than your standard Alfredo sauce. Tossed with the linguine is sautéed mushrooms and lightly breaded chicken livers. If you like chicken livers, you have to try this dish! 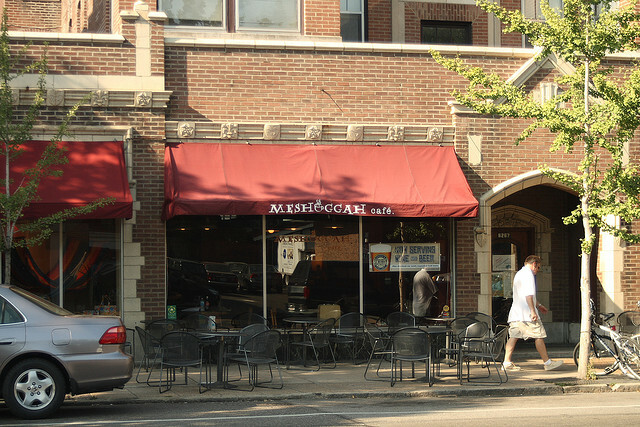 Meshuggah Cafe is one of those places that has one amazing thing on the menu that I just love, but if they eliminated that one thing, I would probably never go back. The menu is really limited and not all that impressive. Plus, I can’t stand their coffee. All that they make is espresso, and it’s just too bitter and strong for me. I want drip coffee that packs good flavor. Meshuggah’s wifi is occasionally spotty, and they don’t offer fountain soda (a problem for me since I don’t drink their coffee and prefer fountain soda over bottled). BUT, when I’m in the Loop and looking for lunch or a late breakfast, I can’t resist heading to Meshuggah and ordering a bagel topped with pesto and fresh mozzarella cheese. They slather the pesto sauce thickly on the sliced bagel, then top it with a large slice of fresh mozzarella that covers the whole thing. Into the toaster it goes and when they bring it out to you, the bagel is steaming hot, the cheese is melty and the pesto is bubbly. I’ve never seen anything like it on any other menu. It’s a winner for me. 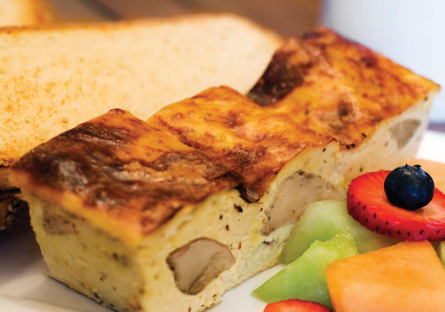 Kopperman’s has been around since 1897, and they definitely have perfected breakfast. 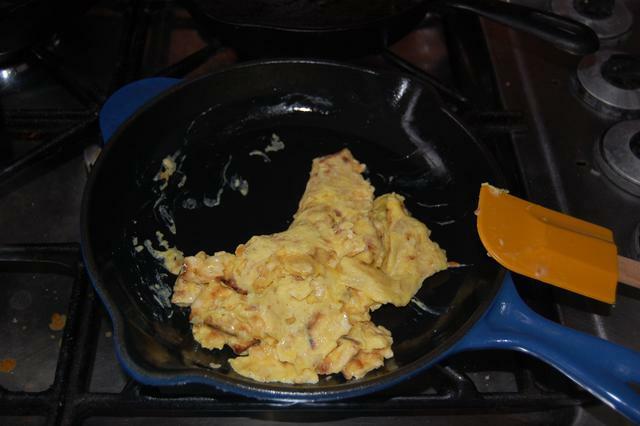 As a Jewish kid growing up in the 1970s, my mom used to make what we called matzah and eggs for lunch. By the time I was in junior high, I would make it for myself. I still make it for lunch or dinner on occasion when my pantry is bare and I don’t feel like going out to eat. I’ve never eaten matzah and eggs out anywhere else, and Kopperman’s makes them great. One of their variations includes thickly sliced pieces of kosher salami. I’m not sure what I would have thought of this dish if I hadn’t grown up on it, but for all my Jewish friends who want a taste of their childhood, head to Kopperman’s. 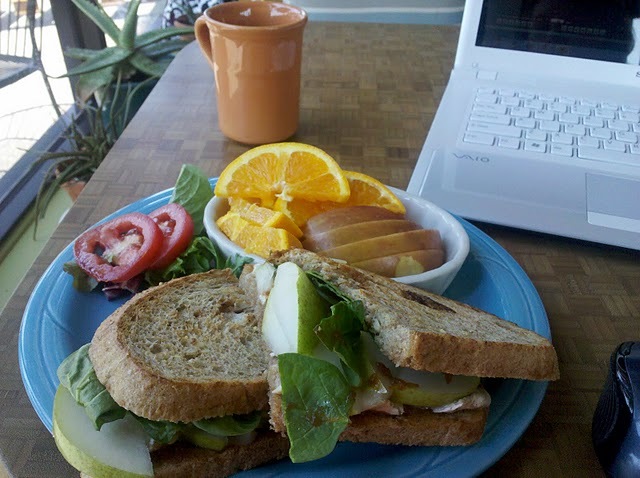 Foundation Grounds has created a winning sandwich with their Perfect Pear sandwich. It is described on their menu as thinly sliced organic pears, organic spinach, organic apple butter, topped with melted brie and a sprinkle of red onion. Yes, this sandwich is vegetarian. But don’t let that stop you if you are a carnivore. The flavors are amazing and it will fill you up until your next meal. I tend to get the same things over and over at sushi restaurants. I don’t do raw fish, so I tend to stick with rolls that have crab, eel or smoked salmon in them. It doesn’t get too routine since I don’t eat sushi out all that often. But when I’m dining at Drunken Fish, I absolutely have to get the Fried Philly Roll. This warm roll is stuffed with salmon, cream cheese and avocado. It’s dipped in a tempura batter and fried, then topped with eel sauce. I’ve introduced many people to this roll, and everyone has loved it. If you have been afraid of trying sushi, this is one that I am confident you will like. And don’t fret over the eel sauce…it doesn’t have eel in it…it’s the soy colored sweet sauce that is always served with eel rolls. 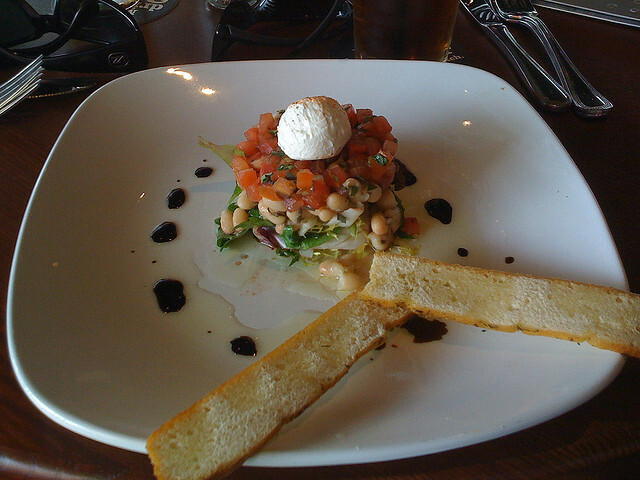 The Tuscan White Bean Salad is something I would never have ordered if it was listed as a salad or an appetizer. I discovered it because it used to be served as the standard side with some of the dinner items. To me, it’s more of an appetizer than a salad since there isn’t much lettuce in the dish. The majority of it is chilled white beans and it has goat cheese and chopped tomatoes on top. The plate is drizzled with balsamic vinegar, which is perfect flavor combination for the goat cheese. The tuscan toast is great for smearing a little goat cheese and piling up the goodies on top. I know this doesn’t sound like much but it really is amazing. Just trust me. Next time you are at Houlihan’s, either order it as a starter or ask if they will substitute it for the standard side (they’ve always said yes when I ask). Most Chinese restaurants carry pretty much the same things. Some turn out better dishes than others, but there isn’t all that much variation. Won Ton King in University City, however, has a scallop dish that I’ve never seen anywhere else. Their Crispy Sesame Scallops is made up of large scallops fried with honey along with a sweet and slightly spicy brown sauce, surrounded by a circle of steamed broccoli. They also make this dish with shrimp if you prefer it, but you can find shrimp dishes anywhere. If you are a seafood lover, make the drive to Won Ton King for dinner sometime. Won Ton King has also one of the nicer dining rooms in University City and has super fast carry out service…no need to order ahead. When I eat at Stir Crazy, I almost always get the ‘create your own’ stir fry where you pick the protein and starch, then fill a bowl of veggies from the veggie bar and a bowl of sauce from their selections before handing it off to a guy at a wok. That said, Stir Crazy has this one menu item that makes me think twice every time I go there. Almond Crusted Chicken. Now I know that doesn’t sound all that unique, but what totally makes this dish is the sauce. 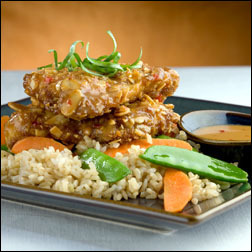 The chicken is marinated in curry and then topped with a tangy coconut lime sauce that is just amazing. If they sold this sauce in bottles, I would be eating it every night! I get bored with salads. I think the reason I don’t normally order them is they have too much lettuce and not enough other stuff. When I do order a salad, it is a dinner size salad to go with my meal. However, Crazy Bowls and Wraps has a salad that has won me over. The Multi Grain Quinoa Salad has quinoa, brown rice, romaine lettuce, organic spring mix lettuce, garbanzo beans, avocado, feta cheese, crispy whole wheat noodles, toasted black sesame seeds and a tahini vinaigrette dressing. Sometimes I add the salmon as you see it in the picture above. Why do I like this salad so much? I love avocado, so that got me to try it. 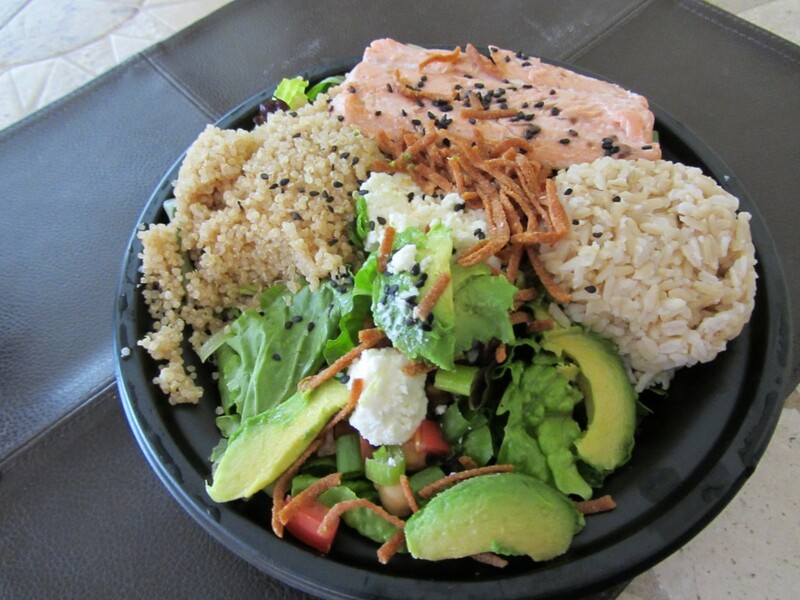 The quinoa and brown rice makes it heartier than a typical salad. The crispy noodles give you that crunch that you want in a salad. And the dressing is wonderful. I could order it for just that. Do you have a favorite dish that is worth driving across town to that one restaurant?